Southern California’s air quality improved from the mid 90s to 2010 and during that period so did the lungs of the region’s children. The four-year average of NO2 and PM2.5 air pollution in five Southern California cities decreased 35 percent and 47 percent respectively from 1994 to 2010. During the corresponding period, the percentage of 11 to 15 year olds living in those cities that had worse than normal lung function also decreased significantly. 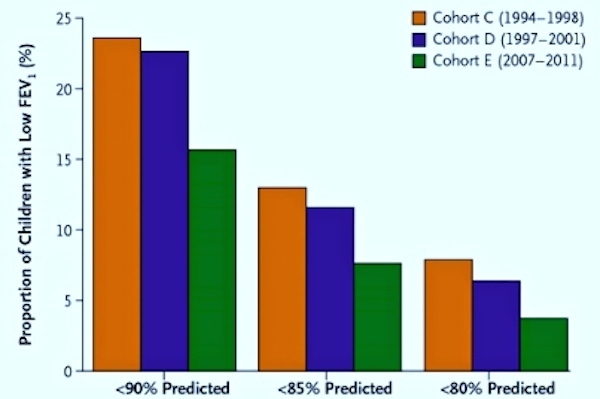 A study carried out by researchers at the University of Southern California (USC), evaluated how well the lungs of 2,120 children distributed between three independent groups (cohorts C, D, and E on the chart) functioned. One standard the study used to quantify lung function was FEV1 which measures the volume of air a subject can forcefully exhale in one second and compares that to a “Predicted” population mean based on factors such as height, weight, and race. The lower an FEV1 value is compared to the Predicted value, the worse lung function is. As shown by the chart, children from later cohorts, when pollution was lower, had significantly lower levels of impaired lung function that children from earlier cohorts. Analysis performed by the study indicates that the lower levels of poor lung function are statistically correlated to lower levels of NO2 and PM2.5. Burning fossil fuels such as coal, oil, and natural gas produces NO2. Vehicular exhaust is a major NO2 source. It contributes to smog formation and inflames the lining of the lungs. PM2.5 is small airborne particles with diameters of less than 2.5 microns (roughly 1/30th the width of a human hair). It also comes from burning fossil fuels. PM2.5 particles can accumulate deep in the lungs and are considered a serious long-term health risk.